Exo makes nutrient-dense real food bars, designed by a three-Michelin-starred chef. 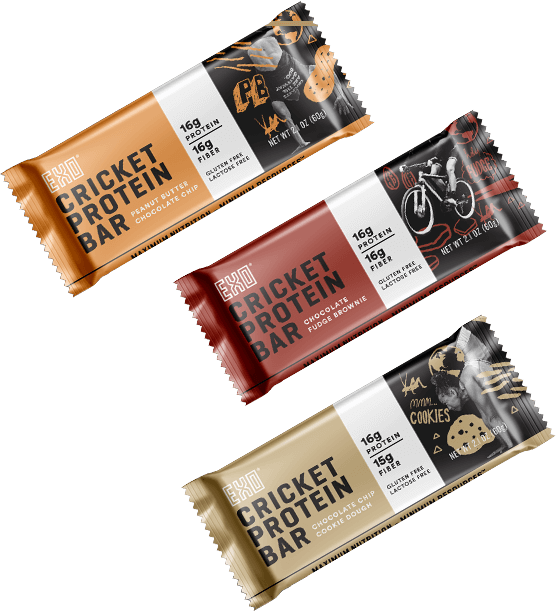 We combine minimally-processed cricket flour protein with ultra-premium ingredients for a bar without compromise. Perfect as a meal-replacement, healthful snack or pre/post-exercise. If our products let you down, we will refund you, no questions asked. If you have a problem with your order, please email info@exoprotein.com within 2 weeks of delivery. Excellent source of protein. Nutritious and delicious. Turn off your brain and enjoy banana bread, pb&j, blueberry, etc. Bars are individually wrapped and can be carried in your glove box or backpack for a boost when you need it. The bars have a brilliant taste, great texture. More importantly, you feel excellent and get a smooth energy supply for your day. I will be ordering again soon! I could eat this as a dessert but a bit too sugary, high calorie (260 - 300 calories a bar) and sweet. Would definitely substitute it for long cycling food or something like that. Great taste.